—Do you find it next to impossible to focus or concentrate? —Have you ever experienced instant clarity after exercise? Alertness after drinking coffee? —Does your brain inexplicably slow down during stress, while multitasking, or when meeting a deadline? —Do you get anxious, worried, or stressed-out frequently? 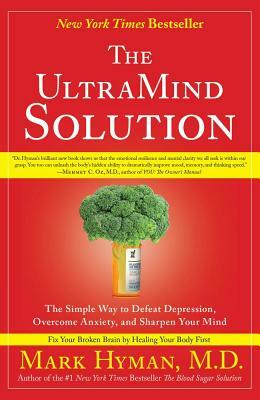 In The UltraMind Solution, Dr. Mark Hyman explains that to fix your broken brain, you must heal your body first. Through his simple six-week plan, Dr. Hyman shows us how to correct imbalances caused by nutritional deficiencies, allergens, infections, toxins, and stress, restoring our health and gaining an UltraMind—one that’s highly focused, able to pay attention at will, has a strong memory, and leaves us feeling calm, confident, in control, and in good spirits. Mark Hyman, MD, is the editor in chief of Alternative Therapies in Health and Medicine, the most prestigious journal in the field of integrative medicine. After ten years as co-medical director at Canyon Ranch in the Berkshires, he is now in private practice in Lenox, Massachusetts. He is the coauthor of the New York Times bestseller Ultraprevention. His websites are DrHyman.com and Ultrametabolism.com.